I had the pleasure of playing dress up with my pals Annette and Kelly a few weeks ago. In celebration of the dawn of spring, we each styled the same color blocking pastel frock from Lulu's and strutted our stuff in front of Sprinkles Cupcakes Beverly Hills on a bright and sunny Saturday morning. We looked like walking advertisement for Sprinkles as the colors of our dress perfectly matched the shop's exterior panels. By the end of the shoot, we even dubbed ourselves the "Sprinklettes." It was a miracle I didn't give in to the buttery aroma of my favorite dessert especially with the un-subliminally hypnotizing "I Love Sprinkles" song from the ATM machine blasting on repeat a few feet away. I love how each of us channeled our personal style and personality through the dresses! Annette went for a mod chic (very vintage couture) look while Kelly stayed classy and elegant. I decided to go for a playful look, layering the dress with a white sleeveless blouse cinched at the waist with a baby pink belt. The flickers of the sequined collar catches the colors of the dress. Although I'm usually hair challenged, I decided to partake in some braiding action and ended up with a braided crown on the top of my head. Minty wedges from Sole Society and an assortment of bangles completes my look. It's always so fun to hang out with my LA blogger girls as I'm constantly inspired by their sartorial eye for style! If you'd like to indulge in the pretty colors of spring, you're in luck! Lulu's is giving away a $100 gift card! And if you win and end up doing your very own style shoot in front of Sprinkles please let me know so we can add you to the Sprinklettes line up! Open to residents of US and Canada only. Winner will be announced on April 26th. Gotta to love Spring pastels! It would be so so amazing to do a style shoot = yes please! wow, the colours are so nice! ooooh i love the pastels colours!! This pretty colours are everywhere and delicious! These dresses are truly gorgeous! so perfect for spring! How amazing these photos are! Really love it, beautiful outfits. Color blocking to the max! Love this!! What cute photos! 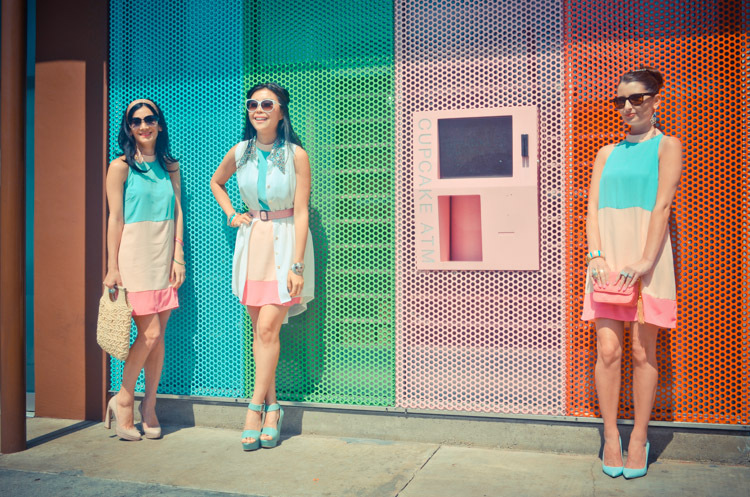 Love the pastel colorblocked dresses. So chic! Beautiful matching mod shift dresses, as well. Soooo cute girl!! Absolutely love your take on this!! Great shoes! Love the different outfits , that's so pretty ! QUE ENTRADA MAS CHULA Y ORIGINAL!!!!! ME ENCANTA!! Very nice stzle. I like that colors. Great day. Love that you all styled the same dress! You almost look like the femmebots from Austin Powers for some reason, but in a more girly and sweet way! (Hopefully you won't be shooting anyone with the guns coming outta your you-know-whats! :DD) Love the looks! So beautiful! I love all looks! This style is perfect for the summer season... These are great dresses for the price. They are made well great fabric material and come in lots of colors and in different sizes.. The way you use three color in different styles and cuts this is fabulous. Even three of them are light shades but you combine them so perfectly. Love the dresses.